Title : Antiquorum Illyrici Orientalis …. Map maker : SANSON, N / COVENS / MORTIER. Size : 20.7 x 25.0 inches. / 52.7 x 63.5 cm. 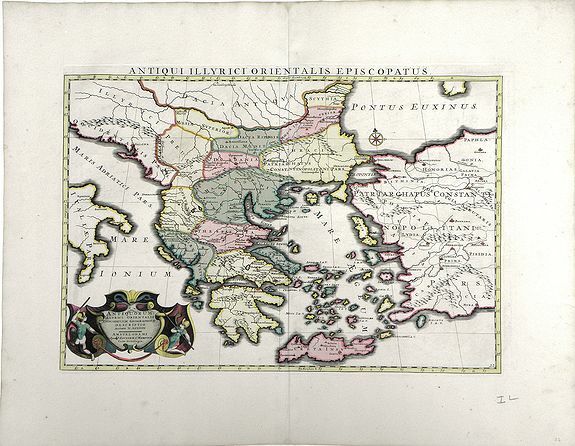 Description :Fine map of ancient Greece, Crete and Turkey by Sanson and published by the Covens and Mortier firm. Shows many ancient Greek cities and sites, such as Nicropolis, Athens, Argos and Heraclea. A decorative title cartouche is at the lower left corner. Fine impression, outstanding original color. For much of the 17th century, the Dutch led the world in cartography with their highly decorative maps. Toward the middle of the 17th century the French began to mark their presence in the world of map publishing. It is generally accepted that the great age of French cartography originated with the work of Nicholas Sanson, who is regarded as "the founder of the more precise and scientific French school of cartography and geography." Condition : Discoloration along top paper edge, small pencil notation in lower right margin corner; tiny wormhole in top left and right margin corners.